Spreading their web of filaments underground, fungi are hidden wonders. Neither plant nor animal, they may be microscopic, or stretch for hundreds of hectares. New Zealand may have as many as 22,000 species, and yet most exist unseen unless they send up fruiting bodies such as mushrooms, puffballs and brackets. Fungi are not plants or animals. They form a separate kingdom that includes mushrooms, toadstools, puffballs, yeast, bread mould and skin infections. They are mainly made of chitin, which also forms the shells of insects. Worldwide there are about 1.5 million species (compared to 250,000–420,000 plant species). New Zealand has about 7,500 known species. But many groups have not been well studied, and it could have up to 22,000 species. Some, like the pukatea bracket fungus, are endangered. Fungi exist in most places – open fields, forests, gardens, fresh water and the ocean. Many live underground, and some live on dead wood. Other types grow on food or in animals, including humans. In New Zealand over 900 species grow in beech forest. A few of them form the black sooty mould that covers beech trees. Unlike plants, fungi cannot make their own food through photosynthesis, so they get it by digesting what surrounds them, such as plant roots, leaves, wood or soil nutrients. They form a cobwebby mat (the mycelium), which is made of many fine threads (hyphae). These spread through the soil or wood, for example, seeking food. Some extend far and wide, while others are tiny. Most plants have fungi growing on their roots. The plant makes food that the fungus gets from the roots, while the fungal threads help the plant roots take up water and nutrients. Many fungi produce the familiar mushrooms and puffballs. These are called fruiting bodies, and are the way fungi reproduce. Some are shaped like umbrellas, others like cups or coral. Some look like a bird’s nest filled with eggs. They make thousands of tiny spores that are spread by wind, raindrops or animals. When a spore lands, it may grow to form a new colony of the fungus. Many fungi are important because they break down leaves and other dead material, which other organisms can then use. Māori used the pukurau puffball as a painkiller, and for burns. They used another species as a fire-lighter. You can eat some mushrooms – but others can kill you. Some fungi cause disease by growing in plants (such as brown rot in peaches), in animals (facial eczema) and in people (nail infections). New Zealand’s pūtawa fungus causes decay in silver beech trees. 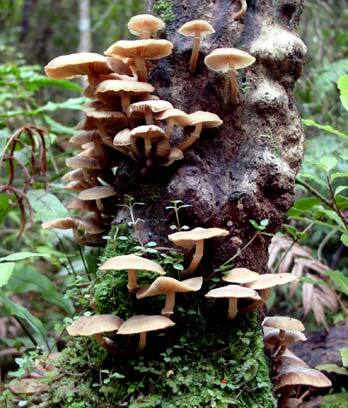 Harore, the bootlace mushroom, can infect kiwifruit and pine trees.